This has got to be one of my favourite treats to bake and of course, to eat. Growing up, I was never fond of Brownies, in fact, I tried to avoid them at all cost , but the older I got and as my penchant for chocolate increased – especially dark chocolate – I turned to Brownies. I can’t remember why I didn’t enjoy them when I was younger, perhaps the fact that nuts are a popular ingredient; and although I enjoy nuts, I prefer my Brownies plain – plain chocolate that is – too fancy and the chocolate pleasure is diluted. Now some of my friends are baking whizzes while others… well, let’s just say that they weren’t born with the baking gene but are thankfully blessed with other wonderful talents, but this dish is as difficult as combining all ingredients into a single pot and pouring the mixture into a lined baking tray. Now anyone can do that…I think :). Over the years I must have tried about 12 different recipes while searching for “The One” and even though I’ve played around with this one a little, I always come back to the original recipe – the way it was given to me by an ex colleague about 9 years ago. Life simply changed the day she brought these into the office. They are rich, dense and truly decadent. I prefer to make them with a Dutch cocoa, but used a mixture of Dutch cocoa and Cadbury Bournville cocoa on these (pictured above) so they aren’t as dark as they otherwise would be. TIP: While looking through the list of ingredients, you’ll notice a hideous amount of chocolate and a gargantuan quantity of sugar, but I’ve proved to myself that if using 50 – 60% dark chocolate, you need every sugar crystal the recipe calls for. When I make the Brownies for a younger audience and choose milk chocolate instead of dark, I halve the quantity of sugar required or they are overly sweet. I’ve also tried using 70% dark chocolate, but that’s a little too bitter for me, but served warm as an after dinner dessert with a good helping of vanilla ice cream or freshly whipped cream, it can work….so give it your best shot and see what works for you. TIP: Once cut up into servable slices or squares, they look very pretty dusted lightly with icing sugar, but they must be cold or the icing sugar melts and disappears before your eyes. TIP: I also sometimes use cookie cutter shapes and “cut out” themed pieces for Christmas, Easter or birthday parties. The kids love them and the adults always think you’re so clever, he he he – not really, just innovative. Off-cuts can be frozen to use later to make cake pops, or nibbles if the cake pops seem like too much hard work. TIP: last one…I promise – also works well for people with nut allergies as you simply replace the chocolate with a nut-free version (like Sweet William in NZ) and a suitably nut-free cocoa (Sun-Valley Foods in NZ) and flour (Pams in NZ). The Sweet William range includes both slabs and chips/drops. Preheat the oven to 180°C (lower for fan forced ovens). Grease and line a 27 x 17 cm baking tin with baking paper or simply line with tin foil. 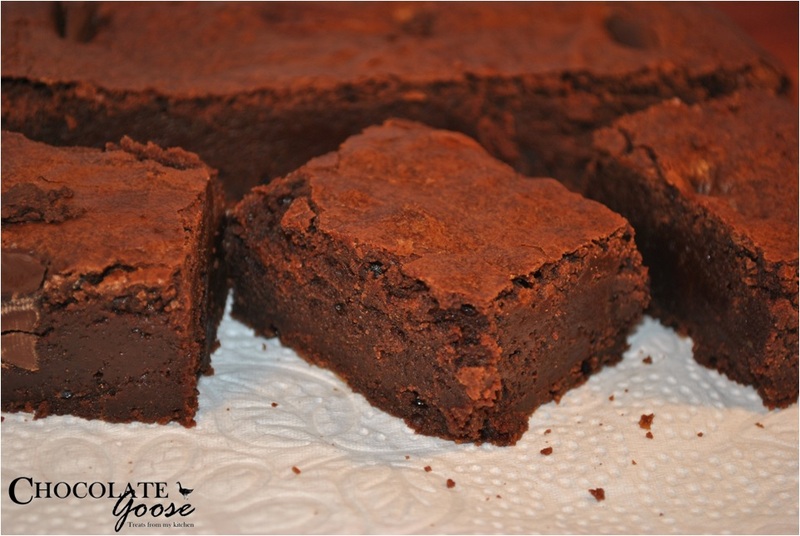 The original recipe calls for a 30 x 24 cm tin, but it’s much of a muchness – I just don’t like my Brownies to be too thin. The thicker/taller they are though, you’ll have to adjust the baking time and watch closely, as oven temperatures differ. Melt the butter and chocolate in a large saucepan over a low heat. Add the sugar and stir gently to combine, allowing the sugar to melt. Add the eggs, one at a time, beating well after each addition (use a hand beater or whisk). Mix in the flour and cocoa until evenly combined – pop a sieve over the top of the pot and sieve the dry ingredients directly into the mixture – it’s not to incorporate air, but to avoid any lumps of flour/cocoa in the end product. Pour into the prepared tray and bake for 20 – 25 minutes (larger tray – thinner brownies) or 25 – 30 minutes (smaller tray – thicker brownies). Remember to adjust the cooking time and keep checking during the last few minutes as a true Brownie MUST be squidgy in the centre.